Milani is a well-known cosmetic line that can be found in big box retailers around the country. They needed a seasonal corrugated display to show case a new line of nail polish that would be positioned as an end cap. Typical end caps usually consist of an open front box with product inside, Milani wanted a display that would allow customers a better view of their latest color lineup. We designed cantilevering shelves that opened up the display making it accessible from all three sides. The top of the header has been left open to allow light to shine into the unit. 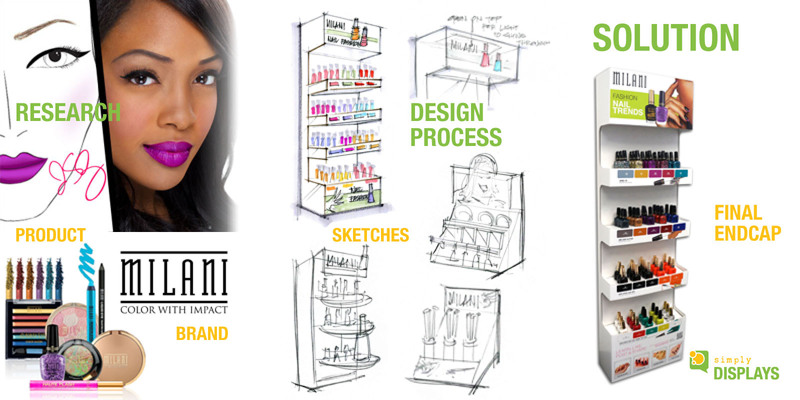 Milani was thrilled with the shelf approach and the unit was a big hit across the country.